Well just look at these goodies. All from the lovely Maddy Jones, a fellow Londoner. 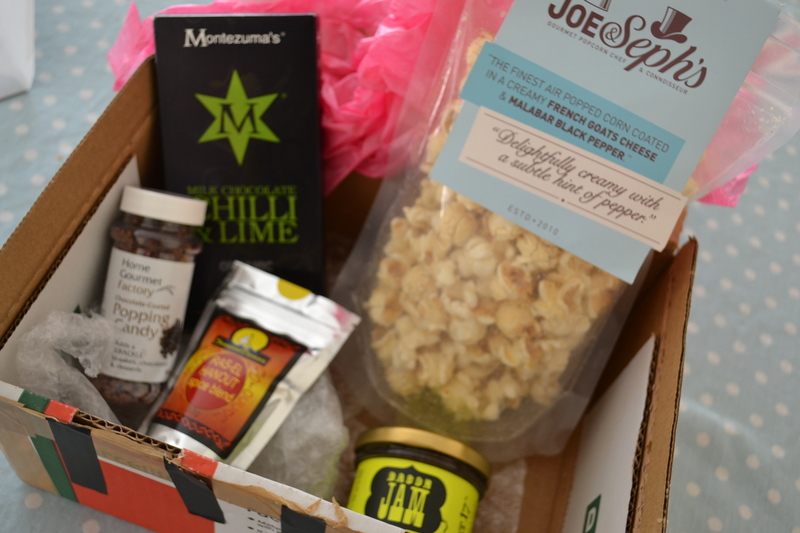 The popcorn was eaten upon delivery – and very good it was too! I’m saving the Montezumas chocolate for special ‘must have chocolate’ moment. My favourite item though has to be the Bacon Jam – can you believe such a thing exists!?! I haven’t tried it – but think it will be a great burger topper. You’ll love these babies – they’re totally good for you, delicious and so easy to put together. Combine all ingredients in a large bowl, leave to sit so they combine nicely. 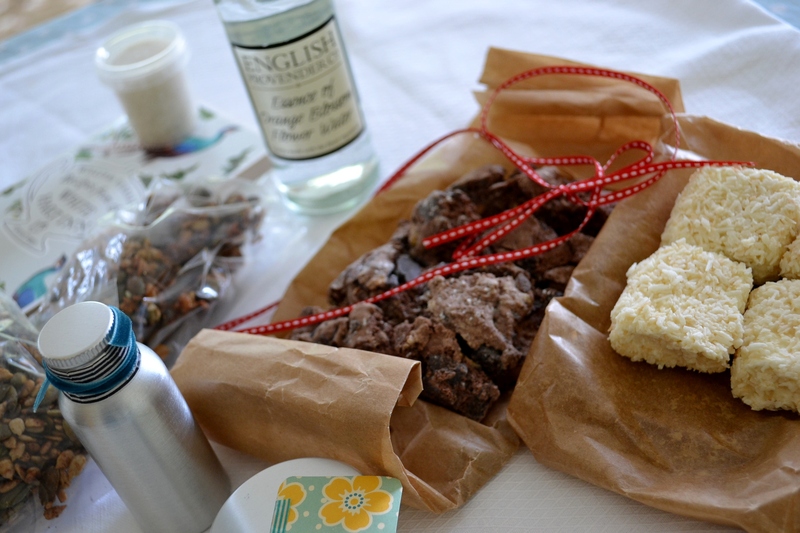 In the meantime pre-heat your oven to 150C and cover a baking tray in parchment paper. Then place tablespoonfuls of the cookie mixture on the parchment sheet, they don’t expand much so size and shape them as you want them to turn out; place in the oven and leave for around 20 minutes, or until they turn a golden brown colour. Leave to cool. Then eat and enjoy! It’s Foodie Pen Pal time of the month again. This month I was very lucky to receive a parcel from the lovely Rebecca Doyle. There was so much inside. Most of the contents were home-made, which makes it so much better. The little silver bottle is a mix of lemon verbena, lemon vodka and lemon thyme vermouth – wow sounds amazing, I’ll save it for the weekend though! Rebecca also included freshly ground spices to make Chai tea. Also included were two roasted sunflower and pumpkin seed mixes. Cannot wait to try these. 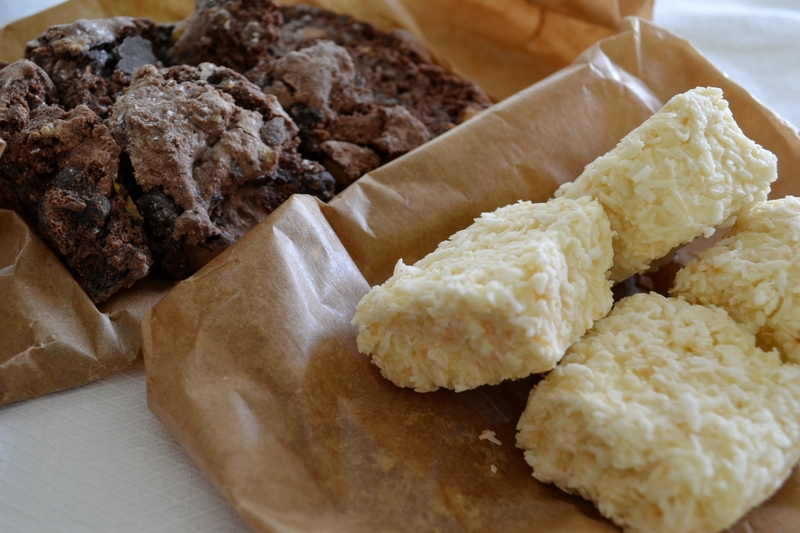 The real stars for me were Chocolate and pistachio biscotti; and vanilla marshmallow with white chocolate and toasted coconut. Both were sampled almost immediately after opening and both were delicious. Thank you Rebecca, for all the love you obviously put into this. I have a touch of the lurgies today, so I’m off to try out the chai tea and maybe a couple of medicinal marshmallows too! Why are women scared of chocolate? It makes me mad and sad at the same time when women beat themselves up over what they eat. What a waste of brain space. I’ve pretty much managed to overcome such thoughts myself and most days eat delicious food that makes me feel good – lots of healthy plant based food that leaves me energised and happy plus plenty of treats along the, because well life’s too short to miss out the treats. Every now and again those unhealthy ‘if I go on a diet and lose weight, life will be better’ thoughts cross my mind. I’ve learned to bat them away, because really I know that being a few pounds lighter won’t improve my relationships, get me a promotion, or make my a better person in any way. I wish all women could break free from such thoughts, and sometimes I think it’s really not such a problem. But then, I have an experience that gets me all mad again. Yesterday I went to a meeting, with five other women, we all had to wait in reception around a coffee table filled with tea, coffee, soft drinks, a rather sad looking fruit bowl, and plate of very fancy chocolate biscuits. I arrived last, during a conversation about the biscuits, one of the women was saying ‘I wish I hadn’t eaten that biscuit, I don’t know why I did, but I only had soup for lunch, so thought it would be ok’. Much agreement and sad looks came from the other women. I pretended I hadn’t heard, sat myself down and exclaimed the beauty of the offering especially the biscuits, everyone looked at my like I was crazy! Later during the meeting hunger struck and I reached forward and picked up a biscuit and got a sympathetic smile from my neighbour! No harm came to me, I ate the damn thing (which was almost, but not quite, as good as it looked), felt less hungry. and went about my day, end of! So why the sympathetic look? Why? Why do women have to beat themselves up over eating a biscuit? Wouldn’t life be simpler, if we just listened to our hunger signals and ate what we wanted when we wanted it? If that”s a fresh salad, great, if that’s a piece of chocolate, even better! So the t-shirts and sunglasses are packed away for another year, and the rain is coming down in bucket loads. But I have to say I love this time of year. Ok, so I can’t have my morning coffee in my favourite place on the balcony, because the seats all rain soaked! 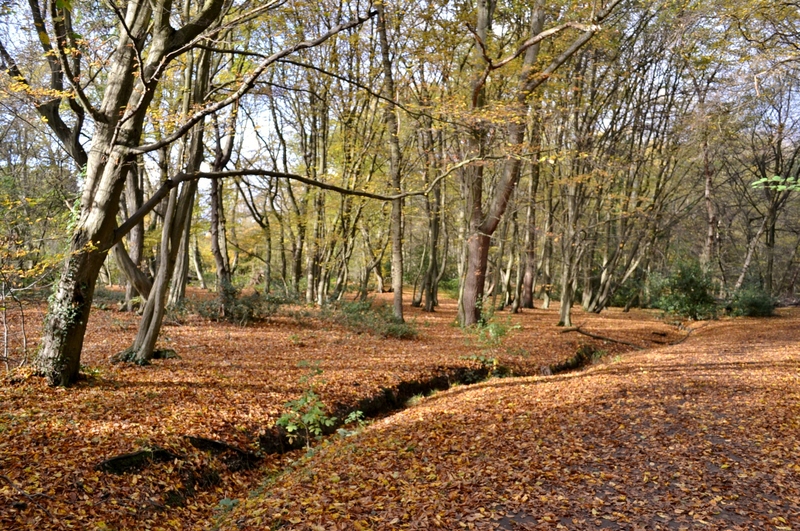 But there’s long walks finishing by the open fire in a cosy little pub; home made soup; jumpers and family nights in playing board games or watching a movie to look forward to. 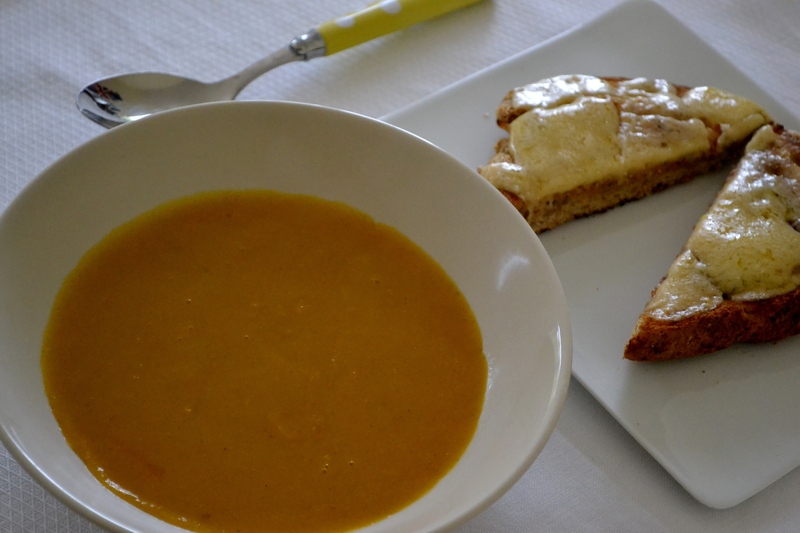 I big bowl of steaming butternut squash with a big ole slice of cheese in toast got me perfectly in the mood for such things today. Do you ever find that you can be feeling a little like you’re on ‘go slow’ mode, only to be transformed by a hot feeling meal? This totally happened to me today – I just couldn’t get myself going this morning, then after this lunch I became unstoppable and ploughed through my to-do list like a woman possessed. As I was happily going about my tasks the doorbell. 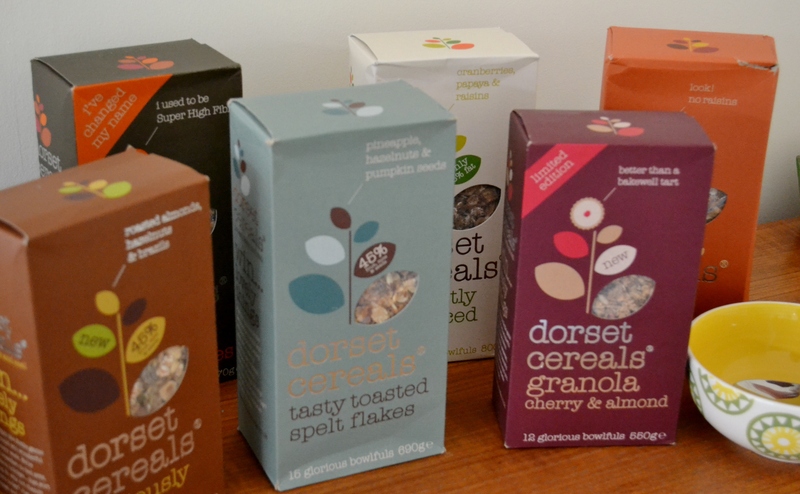 What a lovely delivery – a box full of Dorset Cereals. Thank you lovely people in Dorset for sending me such a lovely selection of my favourites and a couple I haven’t tried before. They run a photo competition and pick their ten favourites each month, who receive lots of cereal. To a someone trying to improve their photography who also happens to be a cereal monster, it’s the perfect competition!